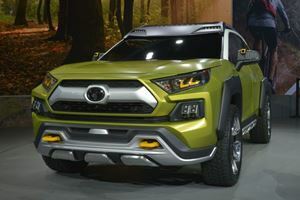 Previous generations of the Toyota RAV4 were becoming outclassed by newer, more comprehensive all-rounder rivals, so the current car is Toyota’s attempt to claw back that lost ground. 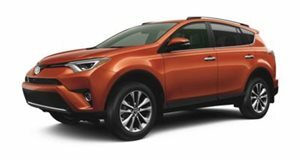 Fortunately for the firm, the Toyota RAV4 is a rather improved vehicle, with the nip-and-tuck additions from the recent facelift further enhancing the spaciousness, safety and straightforward driving attributes that help the Toyota RAV4 stand out in such a hotly contested segment. As a result, whilst the Toyota RAV4 doesn’t comprehensively class-lead in any area, its overall abilities are so high that we still reckon the Toyota RAV4 should firmly be on your ‘to consider’ list. Though the overall design of the cabin may be considered bland to some, the Toyota RAV4’s interior can’t be faulted with regards to build quality. As with nigh-on all Toyotas, everything feels well assembled, and the plentiful-by-segment-standards use of soft-touch plastics and contrasting-color trim pieces is very much appreciated. Better still, there’s loads of room in the passenger compartment, with enough overall head and leg room to accommodate adults comfortably on longer journeys. Cargo room is also very impressive by class standards (hybrid models offer 35.6 and 70.6 cubic feet when the rear seats are up and down respectively, with regular models able to swallow up 38.4 and 73.4 cubic feet), with the low load lip aiding the loading and unloading of bulkier objects. Much like the rest of the car, the Toyota RAV4’s driving manners can be best described as ‘sensible’. Whilst far removed from anything that could be considered exciting or lively, the Toyota RAV4 is nevertheless a stable, straightforward and incredibly easy vehicle to spend time driving. The steering is incredibly light, there’s great overall visibility by SUV standards and the automatic transmissions work especially well when left to their own devices. Body motion is also very well contained, in spite of the fact the Toyota RAV4 is also quite a comfortable car. The only blemish to an otherwise comprehensive driving experience is the rather intrusive amounts of wind noise – which is unusual, considering wind whistle and tire roar are very well suppressed on the Toyota RAV4. Regardless of which engine you select, the Toyota RAV4 won’t be graced with that much power. 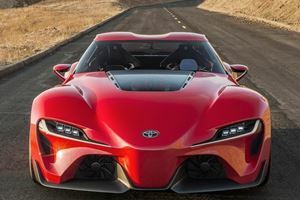 Cars with the 2.5-liter four-cylinder gasoline engine have 176-horsepower on tap, with the gasoline-electric hybrid only having an extra 16-horsepower to play with. That said, the limited outputs aren’t too much of a hassle away from highways, and are plenty enough for buyers who’ll spend a majority of their driving time in stop-start traffic and built-up areas. Both powertrains also have the benefit of being very smooth, and especially so at cruising speeds. Fuel economy isn’t as exemplary, though the standard engine’s 23mpg city/29mpg highway figures are good by segment standards. 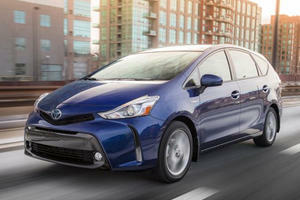 Unsurprisingly, the hybrid leads the way with claimed economy of 34mpg city/30mpg highway, though the higher asking price of this version over a regular Toyota RAV4 means it’ll take a long time before the gas savings compensate for the steeper MSRP. One particularly impressive card in the Toyota RAV4’s metaphorical deck regards overall equipment levels. Even the entry-level, $24,910 ‘LE’ spec cars come with adaptive cruise control, a reversing camera, lane departure warning and hill start assist as standard, with mid-range $26,830 ‘XLE’ models (which we reckon represents the sweet spot in the line-up) adding dual-zone climate control, built-in navigation and HD radio to the spec sheet. As expected from all that safety equipment, the Toyota RAV4 performed exceptionally well in its most recent crash test, having been awarded the full five stars by the NHTSA. On top of being a considerable improvement over its predecessor, the Toyota RAV4 is also a very likeable compact SUV. Comparably-talented rivals mean we can’t quite bring ourselves to recommending it over other offerings, but the Toyota RAV4 is definitely worth investigating further if you’re after a vehicle in this segment. Yeah, we were disappointed too. "Urban SUV." Translation: subcompact crossover.